Theme: “Achieving sustainable development: breaking the circle of poverty and ill-health by investing in public health”. We believe that Public Health has a very big role to play in reducing poverty in our community. Poverty is one of major determinants of health. Aim of the Symposium: The symposium aimed at allowing the students to showcase their preventive health knowledge and skills to potential service delivery partners, prospective employers and the general public. 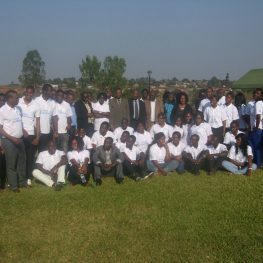 Rationale for Symposium: University of Livingstonia graduated its first ever Public Health generic students on 24 August, 2016. We are expected to graduated 27 generic students and 35 mature entry students. The symposium was conducted in order to demonstrate and inform our stakeholders the kind of training that our students have undergone in the past four years; and also, how the skills and knowledge gained can help in alleviating the viscous circle of poverty, weak health systems and poor health standards that have engulfed our country for the past years. Guest of Honour: Zone Health Supervisor – North. Stakeholders: Administrators and Directors of Government departments, Non-governmental organisations and faith-based organisations operating in the country. Activities: Presentations, Speeches, Videos Clips to show practical experiences, Poems, songs, interactions, etc. Output: Over 10 potential employers came and few alumni from University of Livingstonia; Laws Campus attended the function. Students demonstrated their skills and knowledge to the stakeholders. The officials from University of Livingstonia also attended; The Vice Chancellor, University Librarian, College Registrar and Health of Academics. We also invited the media. The function was broadcasted on MBC.